The first issues of the Duncan Debrief were produced in a tabloid format with a distribution of 10,000. In April of 1993, the premiere issue of the Duncan Debrief was published. Inside J. Robert Duncan, Duncan Aviation’s CEO at the time, described the quarterly tabloid magazine as “one of those rare newsletters that is to the point, packed full of useful information and always worth reading." The Debrief’s mission was to deliver advice and guidance on the operation and care of a business aircraft through short articles written by the aviation experts at Duncan Aviation. It featured articles about our growing capabilities, team members and Core Values. This year the Duncan Debrief turns 21. It doesn’t look anything like the early editions, but one thing has never changed...its mission. The Debrief continues to deliver relevant information with feature stories about cutting-edge innovation, customer relationships and testimonies. It remains our flagship publication and one of the most-trusted and best-read business aviation publications available. We've been told by many Directors of Maintenance that it is required reading in their flight departments. And it is still written and designed in-house by Duncan Aviation’s aviation experts. The Duncan Debrief is now a four-color magazine with a distribution of 18,000. It is available in print, online and on the iPad. The Duncan Debrief is a free. 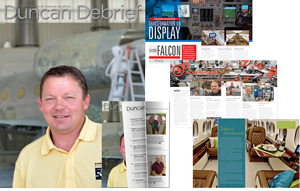 You can subscribe to receive a printed copy of the magazine or access the current and past editions online at www.DuncanAviation.aero/debrief. Or if you are truly on-the-go, the Duncan Debrief is available on Apple’s Newsstand for the iPad. To install the Newsstand edition, search for the Duncan Debrief in Apple’s App Store and download by clicking the “free” button. The app will then be placed in the Newsstand shelves. Once downloaded, readers can receive push notifications each time a new Debrief magazine is published. 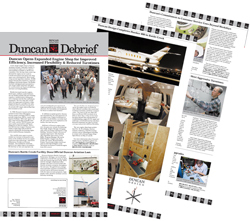 In April of this year, we published the 51st edition of the Duncan Debrief. Inside Todd Duncan, Duncan Aviation’s Chairman, reflects on his aviation career and the changes he’s seen throughout the industry. One thing that hasn’t changed is the Duncan Debrief. It is still one of the only aviation industry publications that tells it like it is with information you can use. And always worth the read.